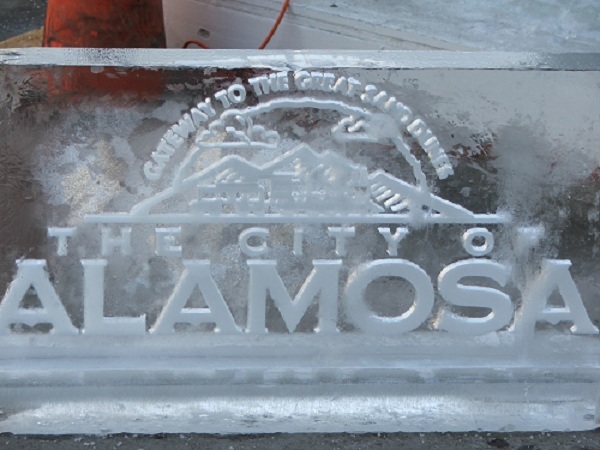 The 4th Annual Alamosa Ice Sculpting was held January 18-19. 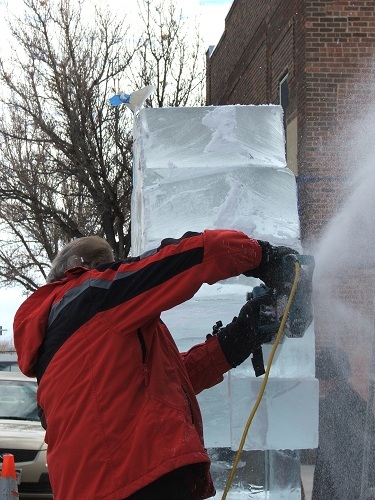 The sculptures began with blocks of ice placed together to form one large block. The artists then began using electric chainsaws to carve out the initial design. The finishing touches, which make the detail of the sculpture, are done with a variety of hand tools. 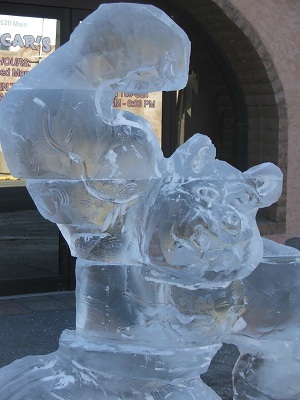 The theme this year was “Mascot Madness” with the focus of the carvings being centered on the different schools located throughout the San Luis Valley. Around 30 people ran in the second annual Rio Rendezvous 5K Run. It was held at 1 pm on Saturday and started at Cole Park. A live band was also playing this year. Formula 151 is from Durango and was nice to listen to while sampling the treats and drinks supplied by many of the downtown businesses. 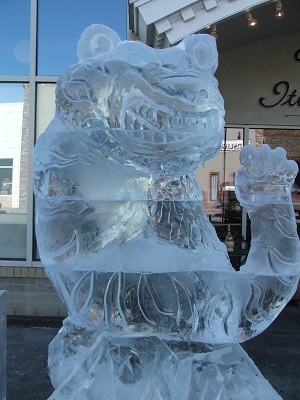 There were around 30 businesses that had special events in conjunction with the Ice Sculpting. Some offered discounts on food, merchandise and some offered free hot chocolate, coffee, cookies, apple cider, fudge, popcorn, cotton candy, jasmine tea, and beer sample--from the SLV Brewing Company. The snowman competition was also held for the second year. Any material but ice and snow can be used and there were several creative ideas. 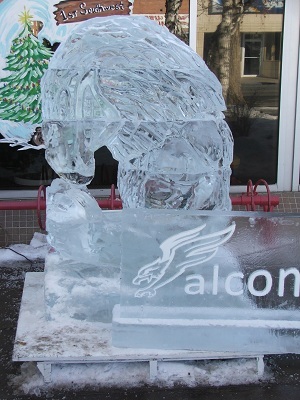 We hope you were able to brave the cold and come watch the ice being carved. If you missed it, the ice carvings will be up until they melt and with the cold weather we have been having that might not be until May. 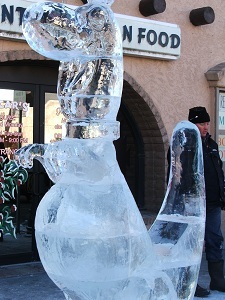 The Alamosa yearly ice sculpting was held on Friday, January 14th and Saturday, January 15th, 2011 in downtown Alamosa. The 2011 theme was “Into the Wild”. 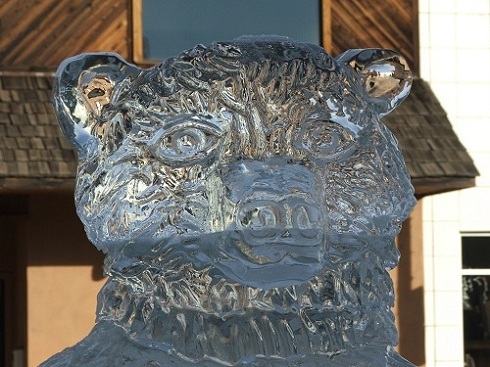 The artists did six ice sculptures including a bear, a rearing horse, a bison, a duck, a fish, and a fawn. The finishing touches, which make the detail of the sculpture, are done with a variety of hand tools. 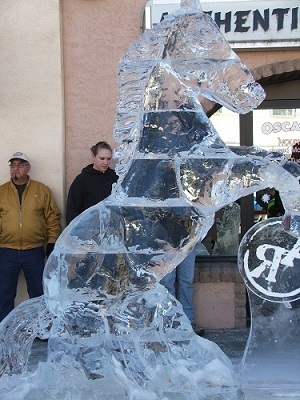 We watched the ice sculptors carve the large rearing horse which took about 2 1/2 hours to complete. It was interesting to watch when an incorrect cut was made; the artists simply took an iron, melted the ice, added another chunk of ice, and finished by “grouting” snow into the crevices. The finished designs were beautiful and it was amazing to see how much detail you can carve into a block of ice. 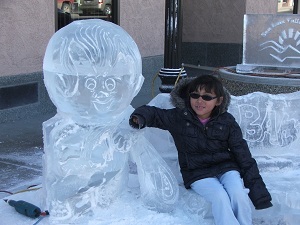 Ice Sculpting in an amazing art and on Friday, January 13th and Saturday, January 14th, 2012, Alamosa hosted their third annual Ice Fest. The theme for 2012 was "Back to the Stone Age" with the cartoon "Flintstones" being front and center. 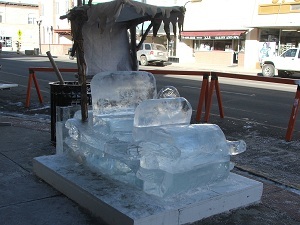 The downtown was filled with people watching the group from Aesthetic Ice (same company as 2011) sculpt the ice blocks into Dino, the Flintstone’s car, Bam Bam, Pebbles, and an excavating implement which Fred used in his job. 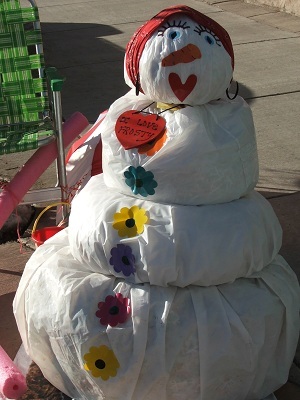 Something new this year was the construction of snowmen using no ice or snow. This created some very imaginative, creative snowmen. Some were made of Styrofoam decorated with stick arms, small Oreos for eyes, and real carrot noses. A 5K Fun Run was held beginning at 1:00 p.m. with competition ages ranging from 10 years old and up. The Fun Run began at Cole Park. Many local businesses encouraged visits in their establishments offering free hot chocolate, fudge samples, hot cider, cookies, brownies, and coffee. Several restaurants offered a free meal with the price of another. Other businesses offered discounts on merchandise. 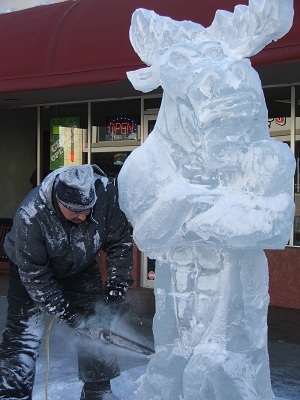 It was a great day to be in Alamosa but if you missed the actual carving the designs will be around until they melt! Craig Winter is a member of the National Ice Carving Association, The American Culinary Federation, and The Professional Chefs Association. 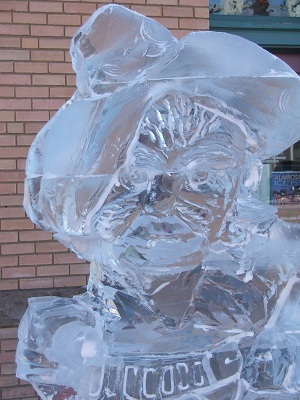 He is the co-owner of Aesthetic Ice Company which is Colorado’s Premier Ice Sculpting Company. He is a chef instructor at the Art Institute developing and directing the advanced pastry degree program at the school. 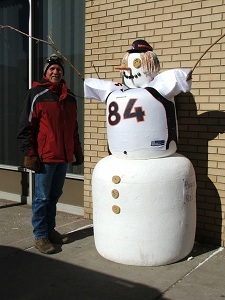 Craig was part of a winning second place team at the International Breckenridge Snow Carving competition. Executive Chef Robert Meitzier is a former instructor in the College of Culinary Arts at Johnson & Wales University. He is also co-owner of the Aesthetic Ice Company. 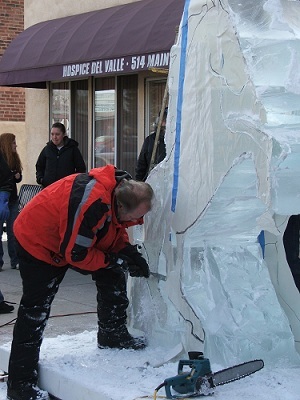 Robert is a member of the National Ice Carving Association and has competed and medaled in numerous ice competitions including placing second at the International Breckinridge Snow Carving competition. Ian Kunter received a degree in Culinary from the Art Institute of Colorado. He works part-time at Aesthetic Ice. Ian is a member of the National Ice Carving Association and does onsite ice carving demonstrations for the Art Institute of Colorado. 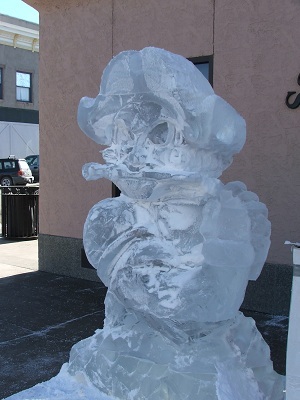 Michael Pizzuto is a member of the National Ice Carving Association. Michael has had advanced ice training in Tokyo, Japan and numerous international competitions where he has medaled. He is the owner of Creative Ice Sculptures and works with Aesthetic Ice on a continual basis. Michael has also co-authored two ice carving books.